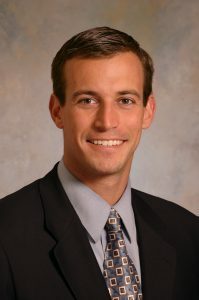 J. Martin Leland III, MD is a Sports Medicine Surgeon and the Medical Director of Sports Medicine at University Hospitals Geauga Medical Center in Cleveland, Ohio. Dr. Leland specializes in the care of sports-related injuries, with a particular focus on injuries of the knee and shoulder. Dr. Leland is the Associate Editor of Technology for the Arthroscopy Journal, one of the most well respected journals for Orthopaedic Sports Medicine in the world. Dr. Leland also serves on the Board of Directors for the Arthroscopy Association of North America (AANA). His clinical practice includes arthroscopic surgery with a focus on ACL reconstructions, meniscus repairs, shoulder dislocations, rotator cuff repairs and labrum repairs of the shoulder. He has worked as a team physician for the Chicago Blackhawks, Philadelphia Eagles, Philadelphia Phillies, and numerous colleges and high schools. Dr. Leland regularly teaches other Orthopaedic Surgeons around the country how to improve their skills in arthroscopic surgery.